This tapered and bubbly looking vegetable is a very bitter food but with the spices the flavours work well together. I prescribe this recipe for diabetics as the elements in this food helps balance blood sugars. You will be able to find it in your local Asian food store. 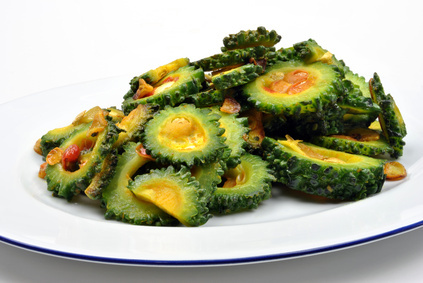 Slice the karela in half lengthwise, then slice across and fry lightly. Separately fry onions, spices and ajwain for a few minutes. Add the karela, a tiny bit of water and steam for 5 mins or until tender. Serve with some fresh coriander.